The Total Leader concept identifies four critically important areas or levels that we feel a person must master to become a Total Leader. Its a lifelong process. Personal productivity is the foundation of all effective leadership. Personal productivity is the ability to manage yourself, manage your time, and manage your priorities to operate at maximum performance. It is only when you can optimize your own performance that you are truly able to increase the performance of others. Personal leadership is the ability to lead yourself – to be a leader of your own life. Most people just let life happen to them and then suffer the consequences. Personal leaders determine the life they want, and then through planning and action make it happen. Personal leadership also means becoming a Total Person® – a person who is growing and developing in all six areas of life, including Family and Home, Financial and Career, Mental and Educational, Physical and Health, Social and Cultural, and Spiritual and Ethical. Personal leadership is the core of an individual’s character and the basis for developing trusting relationships that are vital to leading others. 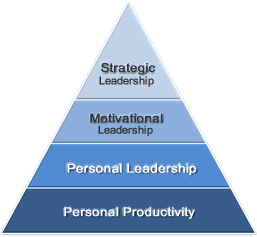 Motivational leadership is the capability to lead and motivate others. A motivational leader understands that people are the source of all progress and innovation, and thus the key to business success in the 21st century. Inspiring motivation in others is crucial to developing a productive and engaged team. A motivational leader is able to help people develop and use more of their full potential. Strategic leadership is the ability to lead an organization. A strategic leader works through teamwork and collaboration to define and develop the purpose of the organization, the key strategies, the optimum structure, the right people in the right roles, and the most effective processes for an organization to succeed. Strategic leadership is not only setting the course, but also following through and executing the plan for completion. How do you get there: Read a few books? Go get an MBA? Go to a quick seminar? No. Participate in a development program based on your existing level of practice.